An album steeped in the roots of American music, "Fixin' To Break Down" blends blues, old-time, country, folk and rock. 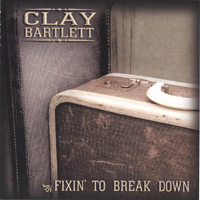 Fixin' To Break Down marks the debut of Clay Bartlett as a solo artist. An album of original songs, Fixin' To Break Down is the sound of a singer/songwriter who has found his own voice. With care for the poetry of the song in the tradition of Bob Dylan and Townes Van Zandt, Clay Bartlett has crafted an album of humor and despair. Clay Bartlett has been a longtime fixture in the Northwest music scene and has recorded with The Supersuckers (Must've Been Live), Gerald Collier (Low Tar Taste) and his former band The Cheap Ones (Leaving Lake City). Through his musical adventures, Clay has shared the stage with artists as diverse as Mike McCready (Pearl Jam), Pete Droge (The Thorns) and Willie Nelson. An album steeped in the roots of American music, Fixin' To Break Down blends blues, old-time, country, folk and rock. Opening the album is the dark beauty "Days Come Falling Down" with a lap steel reminiscent of Hank Williams. There is a front-porch feel on "Daniel's Blues" and "Bury Me", while a wanderlust exudes through the open roads of "Airstream". Quietly ending the album is the Apocalyptic lullaby "Only 39 Days". For Fixin' To Break Down Clay Bartlett has brought in some fine players. Musician extrordinaire Allen Terhune (Terhune, Gerald Collier, and The Supersuckers Country Tour 1999) adds a haunting beauty with accordion, lap steel and resonator guitars. Chris Cline (The Cheap Ones & Evangeline) lends his tasteful electric guitar. Kevin Warner (Evangeline and Jesse Sykes & The Sweet Hereafter), Russ Riedner (The Cheap Ones), Rachel Niman, and Jake London add their talents. To support the album, Clay Bartlett will be touring solo and with a band in the coming year. Clay Bartlett has truly delivered an album of soulful and beautiful songs...you can hear love and heartache, yearning and satisfaction all at once. So much has come and gone in the Seattle music scene, yet Bartlett is sticking to his story - and it pays off amazingly. A real, Americana winner. Incredible. Clay Bartlett can make you feel like you've been dragged through the mud in the hills of Kentucky ("Days Come Falling Down"), yet rise with a bit of hope, as in "Airstream." It's a perfect circle of songs that begins and ends like it should go on forever. A wonderful collection. Can't wait to hear more.